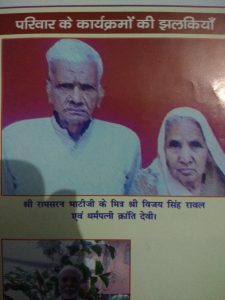 Subedar Vijay Singh Rawal was born in the family of Shri Naubat Singh and Smt Kasturi Devi in the village of Ghodi Bachheda in Tehsil Dadri, District Gautam Buddh Nagar of UP. His family was well known, reputed and respected one in that area. He had six siblings; 3 brothers and 3 sisters. Brothers are Gajraj Singh, Rajaram Singh and Shrikrishna Singh while the sisters are Smt. Vidya Devi, Smt .Rajesh and Smt. Shanti Devi. 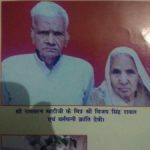 He was married to Kranti Devi on 29th February 1960. He had four sons and two daughters and they are Anil Rawal, Sunil Rawal, Sushil Rawal, Rajesh Rawal, Smt Anita and Smt Babita. He joined Indian Army at a very early age and while serving the army he did telecommunication engineering course and finally had retired as Honorary captain in 1985. 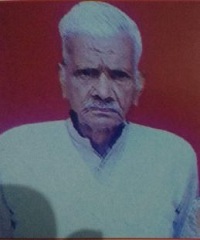 After retirement he spent his life in village and continued his work for the progress of the village and nearby area. He breathed his last 0n 30th December 2017. Subedar Vijay Singh is a name that every individual of his village is proud of as the great man had spent his entire life in the service of country and the society. His selfless endeavour in service for others had made him an inspirational figure. It is evident from his gesture towards his friends who were economically weak and had thought of quitting the studies. Though Subedar Vijay singh was very young but helped him financially to pursue the studies. Besides, when he was serving in Army , many of his friends were still studying and needed support, Vijay singh helped them without making them feel about it and expecting any gratitude. The society bows to such honest, kind and selfless warrior.